Drumming Technique and Melodic Jazz Independence. Composed by Ari Hoenig. Method/Instruction; Modern Drummer Readers Poll; Percussion - Drumset Method or Collection; Technique Musicianship. Jazz. Book. 76 pages. Alfred Music #98-37458. Published by Alfred Music (AP.98-37458). Can you say four-way coordination? This book will vastly improve students' creative melodic independence and help broaden the musical possibilities of improvisation through theme and variation. This is an in-depth look into jazz comping, using melodies that stress the second triplet note. 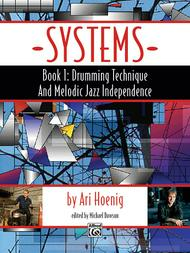 Each "system" is designed to help drummers prepare for the world of highly rhythmic band improvisation. This intermediate to advanced level book includes hand warm-ups, flam warm-ups, swing prerequisites, triplet displacements, and much more. Audio examples are available for download. "Those familiar with Ari Hoenig will be aware of his melodic drumming style and this great book gives an insight into that style. . . . a serious study in coordination, requiring diligent practice, which will help the student make a vast improvement in their coordination and interpretation of phrases. Five Stars!"